river « "I do wander everywhere"
It’s Monday on my WordPress blog, and after a three week holiday break, I am back in Alberta. 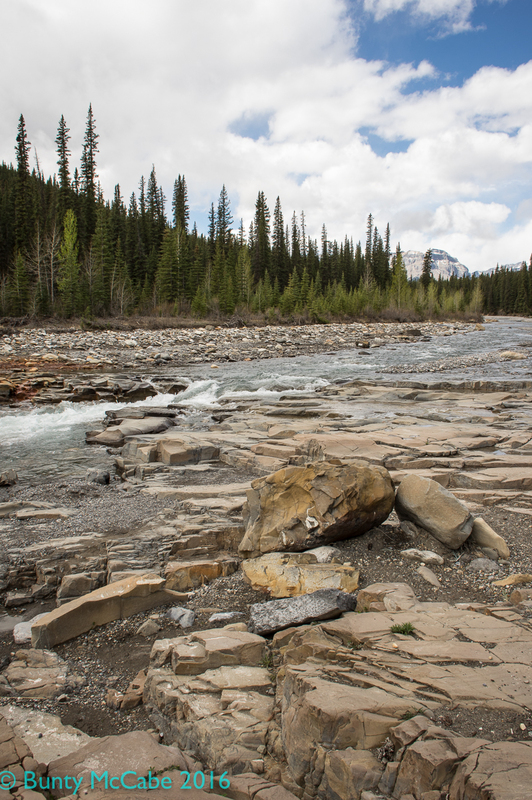 After the morning exploring Crescent Falls and having lunch in Nordegg, we spent the afternoon at Kootenay Plains Provincial Recreation Area. Parking is just off the David Thompson Highway where we found this memorial plaque explaining the names of the four peaks behind it. All four peaks are part of Ex Coelis Mountain. 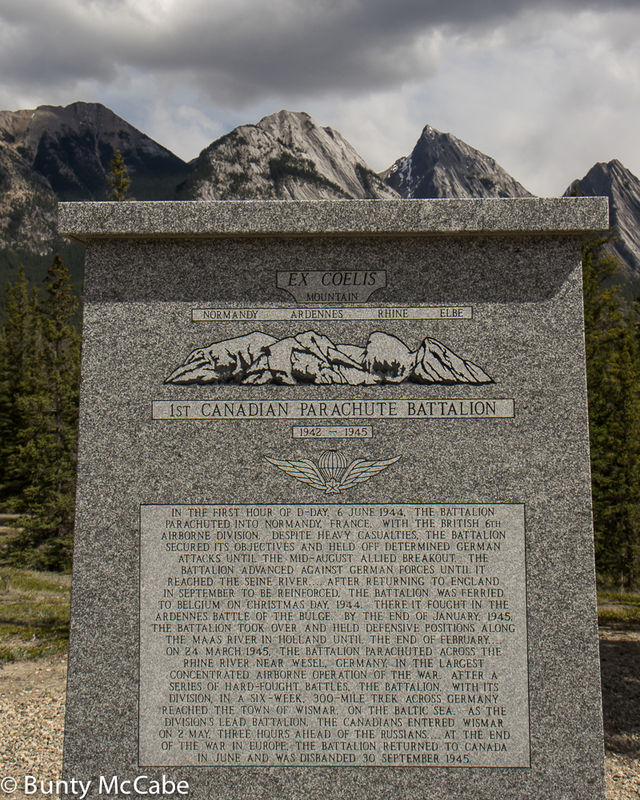 Four mountains named after battles fought in France, Belgium and Germany by the 1st Canadian Parachute Battalion. We then set off to hike the 5km to Siffleur Falls (next Monday.) There are two suspension bridges across two arms of the North Saskatchewan River. Yup, the same river as seen in these photos, but further east. The photo below shows three of the four mountains named above: the Ardennes, Rhine and Elbe. Crossing the North Saskatchewan River by the first suspension bridge. This was the scene looking upriver from the second suspension bridge; Mount Elbe looks even closer. Crossing an arm of the North Saskatchewan River. 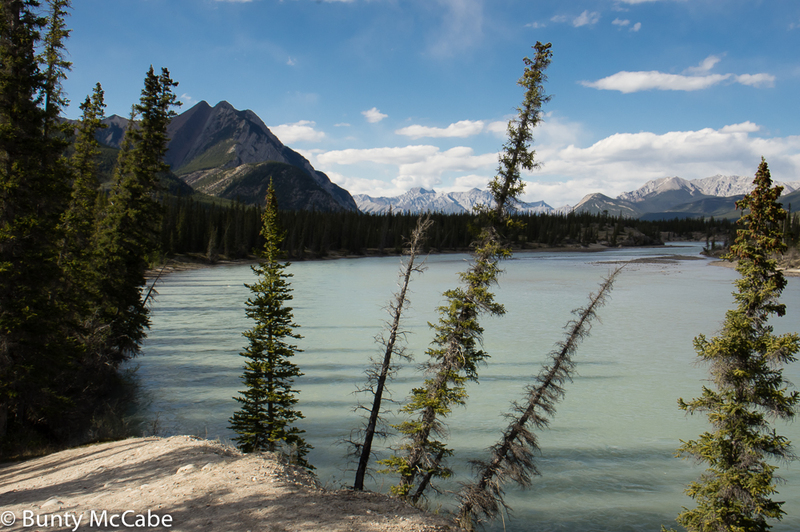 This last photo was taken as we came back from the hike and looks downriver towards Abraham Lake. 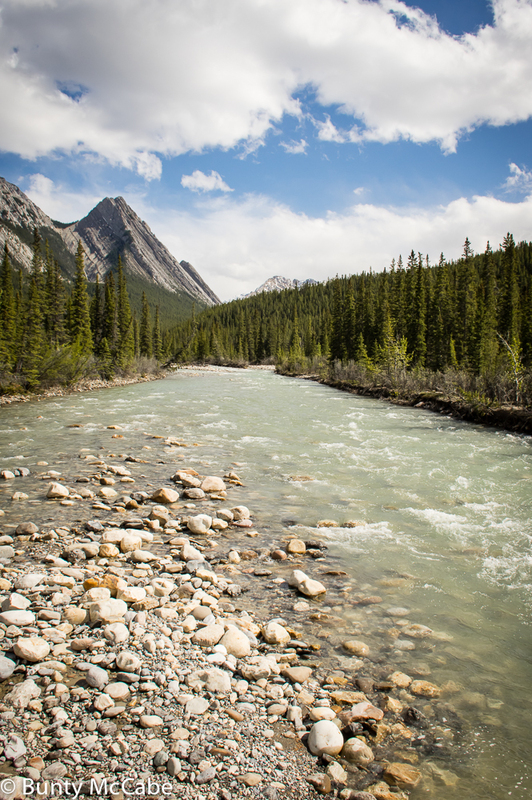 North Saskatchewan River as it flows toward Abraham Lake. The power of falling water! 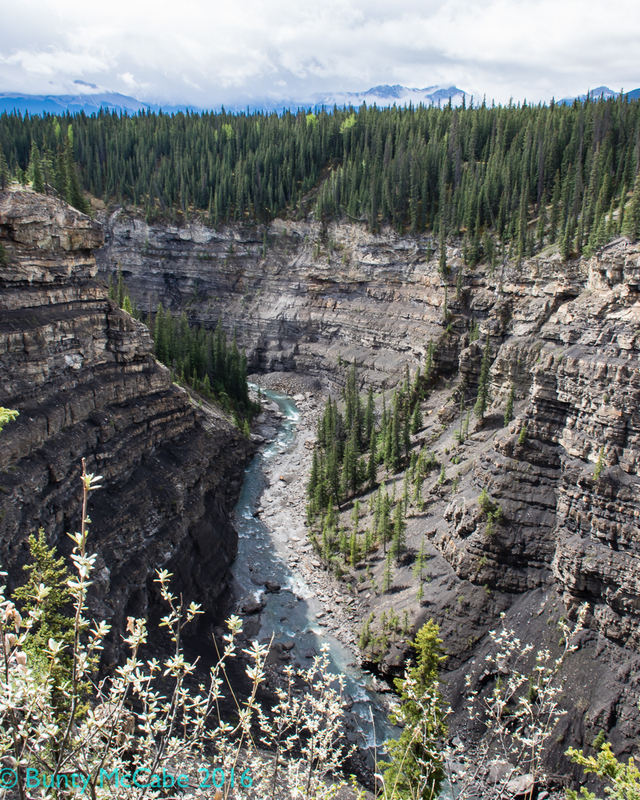 As you drive up to Crescent Falls, you pass the lower reaches of the Bighorn River and can marvel at the canyon created over centuries. Once you get to the parking area by Crescent Falls, the river above the falls looks benign. 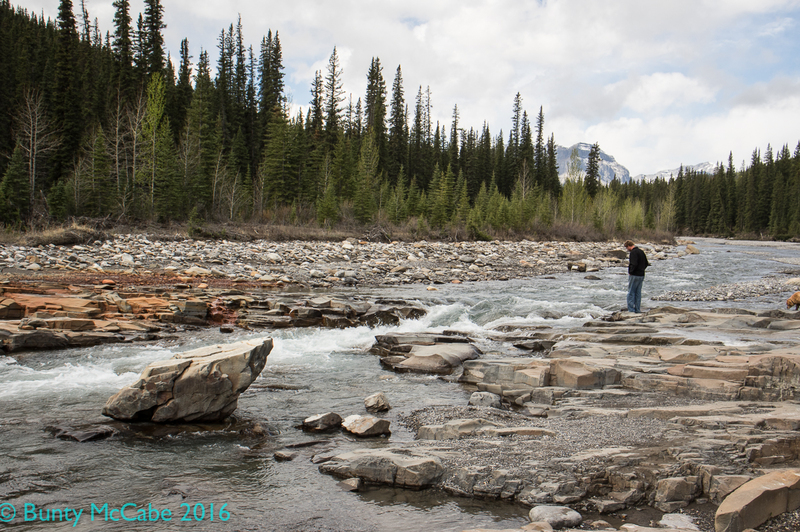 The winter of 2015-2016 was extremely dry and it was still early spring so the water level in the river was very low. 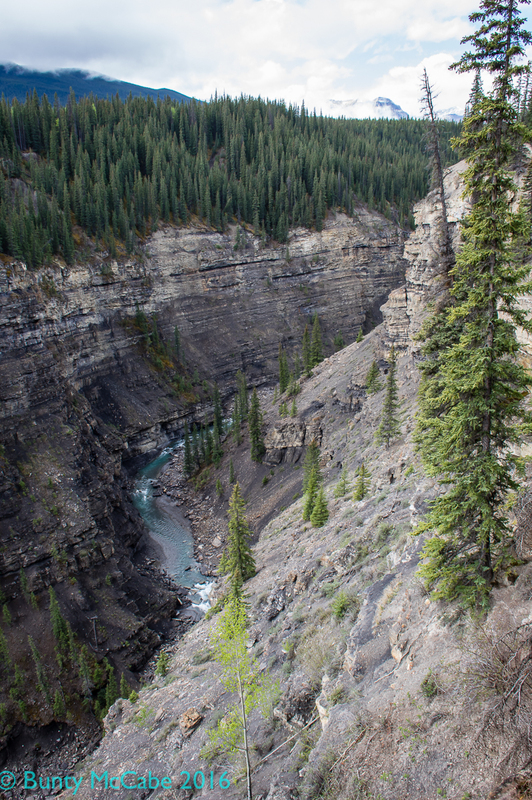 This is the view looking west northwest up the Red River, from the middle of the Star Mine suspension bridge. Calm, and promising a hot, clear day. One of the few remaining bits of evidence of the existence of the mine is this structure sitting at the top of one of the low hills. The photo below tells the short history of the bridge – which was used to transport men and coal from a mine on the other side of the valley to the rail lines on the other. The bridge itself was fun to cross. The photo below is on the mine side; the sign asks you not to swing the bridge and to keep the load below 20 people. The East River Ferry runs back and forth from East 34th Street, Manhattan, to the foot of Wall Street. It was a cheap and easy way to get downtown from the Pod 39 Hotel (on East 39th!) It’s a hovercraft and does it ever move! Makes it rather hard to take photos as you’re hanging onto your seat, or the rail, to avoid being pitched onto the deck. The pictures were taken from north to south. Click on each photo to see a larger version. The first photo includes the UN and the Chrysler buildings; the second adds the Empire State Building which is also in the centre of the third. The fourth picture shows the foot of Wall Street on the left with tall, masted ships in the foreground. The last picture features the helicopter port on the East River which is next to the Wall Street ferry terminal. Drumheller, Alberta: A classic view. 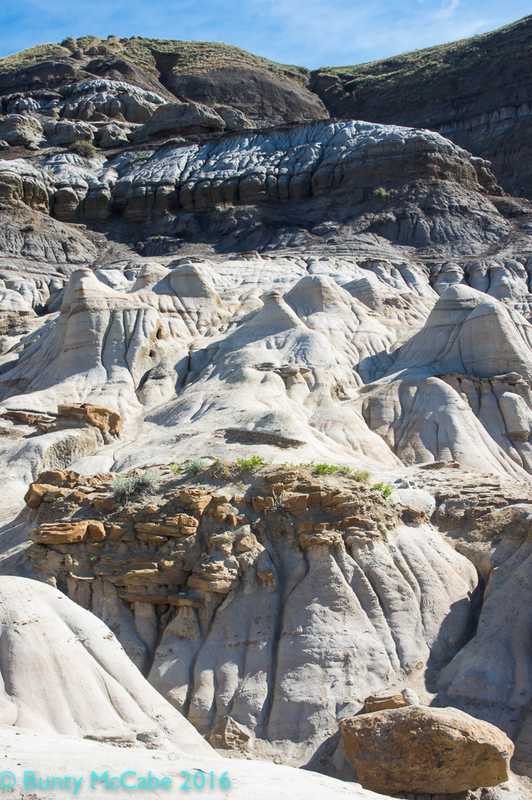 The Hoodoos of Drumheller Alberta are worth a visit. 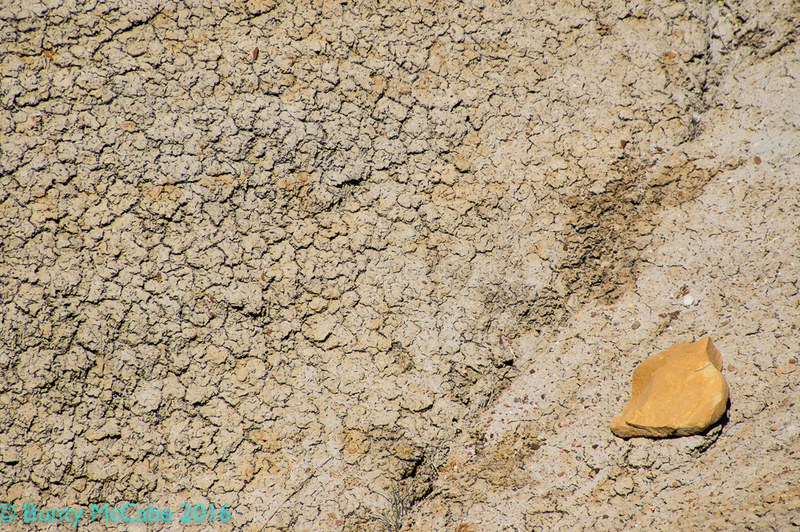 A small but impressive collection is to be found near East Coulee in the valley of the Red River southeast of the town. 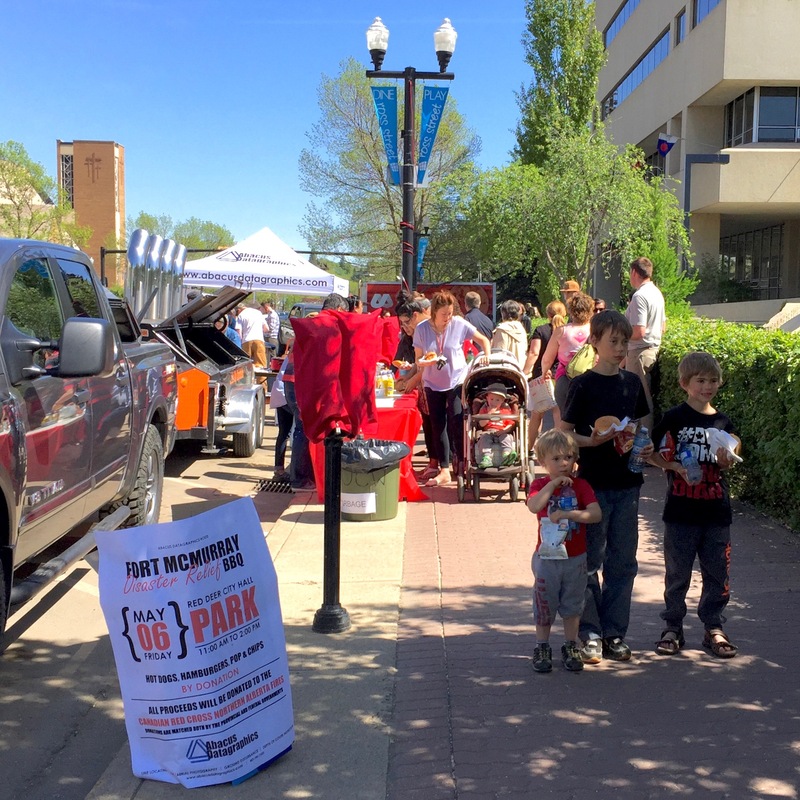 The best section is surrounded by walkways and managed by the Province of Alberta. Drumheller, Alberta: Alberta got very little moisture over the 2015-16 winter and it shows. 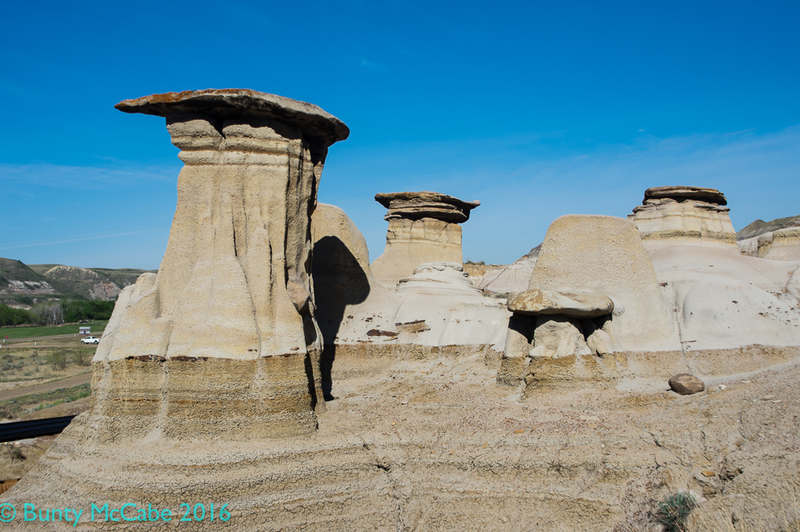 These wannabe Hoodoos are just outside the protected showpiece Hoodoos but illustrate how a harder rock on top of a softer one can eventually result in the formations in the first picture. 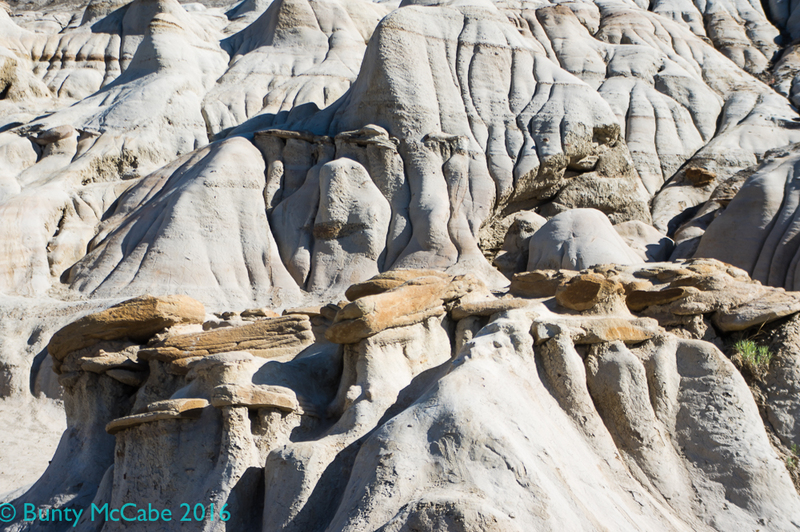 You can find more about Hoodoos here. 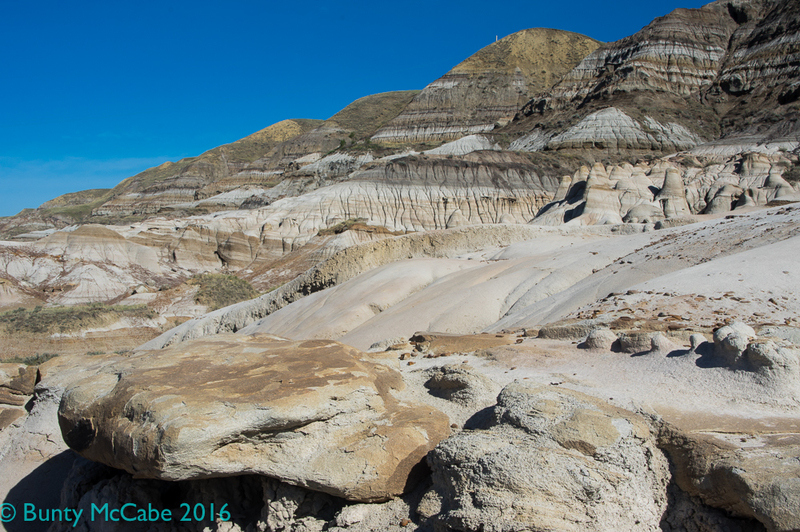 And more about East Coulee/Drumheller Hoodoos here. Photos taken mid-day. That’s my excuse and I’m sticking to it! 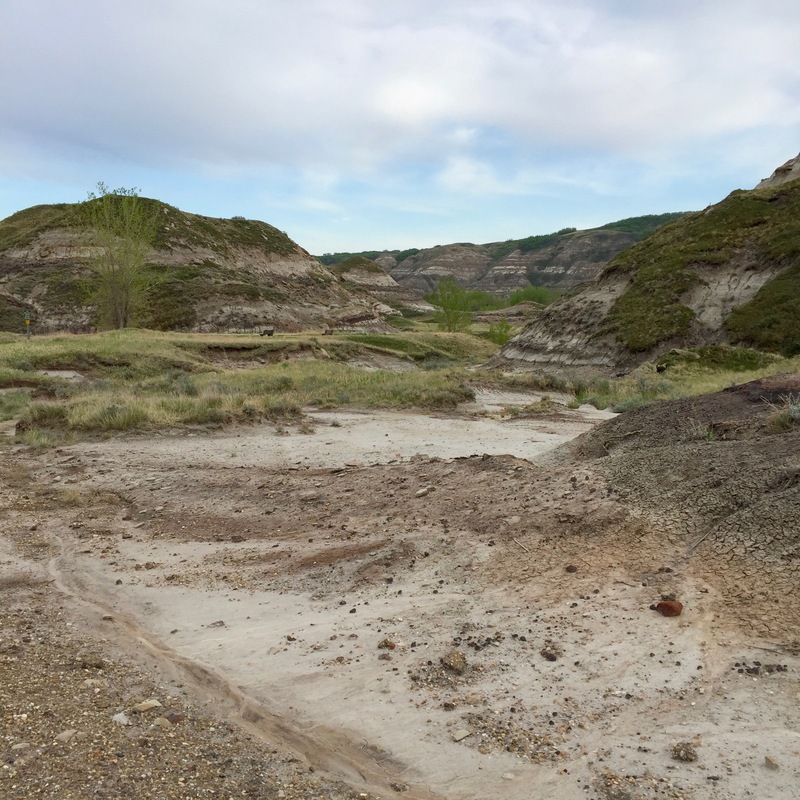 Badlands – Drumheller near the Red Deer River. 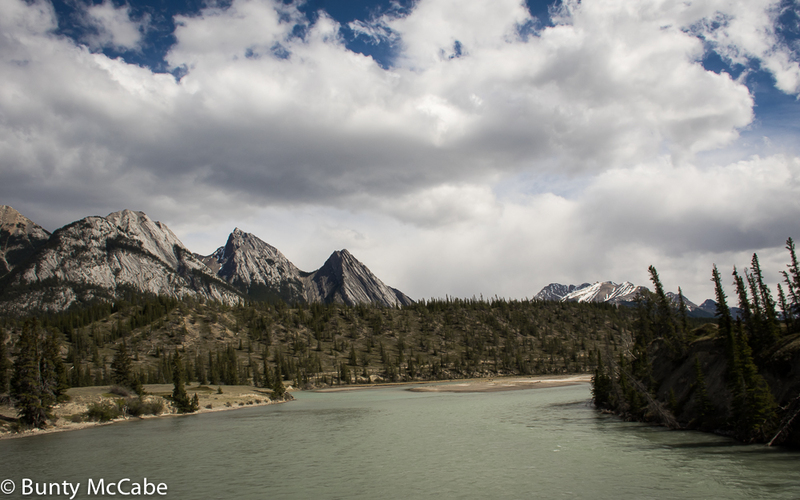 In early May we flew to Calgary, Alberta, rented a car, and drove through parts of Alberta and British Columbia to Vancouver where we dropped off the car. Our first stop was Drumheller; the Red Deer River has created a stunning landscape through its valley. Drumheller is also the location of the Royal Tyrrell Museum. Our ‘tour guide’ in Drumheller was my second cousin who recently retired after 34 years at the Museum. One of the places he took us, downriver from the town, was the Star Mine Suspension Bridge on a calm sunny morning. After we left Drumheller we drove most of the day but stopped for lunch in Red Deer where the town had organized a fund-raising barbecue for Fort McMurray (Alberta) which was experiencing a devastating fire causing all of its 88,000 residents to become disaster refugees. (The fire started on May 1; this was May 6, and the fire was still out of control.) This article from MACLEAN’s Magazine, published May 12, is long but has some stunning photos and graphics to show the extent of the disaster. Residents were only able to return to Fort Mac starting about 10 days ago. While I usually took pictures with my Pentax K5 or my Sony R100/3 I made a point of getting a couple of iPhone photos every day – so I could post to Facebook. I expect to post more photos of this trip soon! iPhriday begun by Gray Days and Coffee blogger. See other posts here. Looking south – the shore is the part that’s reflecting (on the left,) and in front of the trees on the other side. The water is the grungy bit in the middle. The dark parts are exposed river bed. There was a storm surge today in Maritime Canada caused by an extreme low pressure system and the fact that we have just had a new moon – when tides are most extreme. There was extensive damage in the Bay of Fundy, but none that I’ve heard of in PEI. The high winds didn’t help. The converse of the extra-high tide is an extra-low tide, which we noticed around supper time. Looking North – the shore is the part that’s reflecting on the right and the mottled part in the middle. The river is flowing on the left. Looking North from closer to the bridge: the shore and river are more obvious in this photo. This post is late for the WordPress Photo Challenge of April 1 on the subject of Landscape and you can see other entries here. 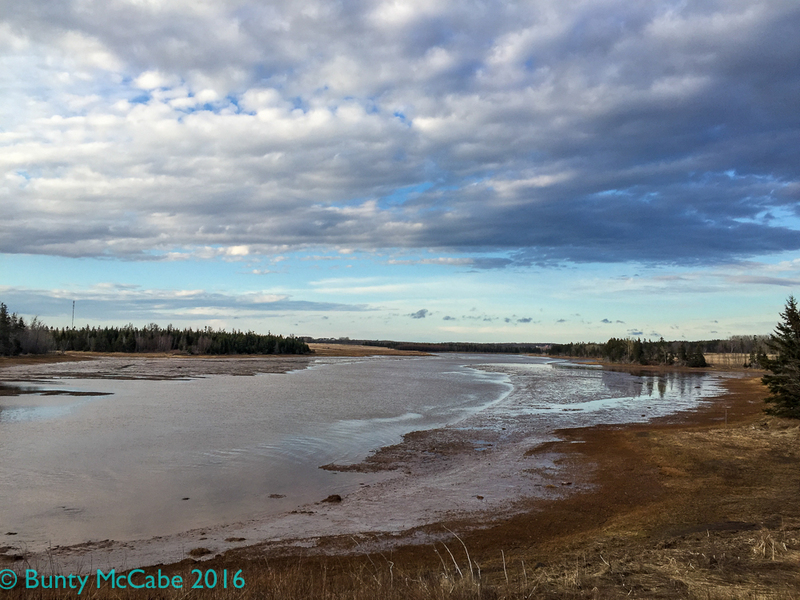 Looking west – Not so much a photo of the low tide, but you can see a gravel bar on the far side of the river and if you click on the photo to enlarge it you will notice a lone Canada Goose (we think it’s injured) in the river current. This post is also for the iPhriday challenge begun by Gray Days and Coffee. You can look for other iPhriday participants by searching for the category or the tags. The three wide photos were taken on an iPhone 6 using Hueless and edited in Lightroom on an iMac and the fourth was taken with the iPhone Camera.